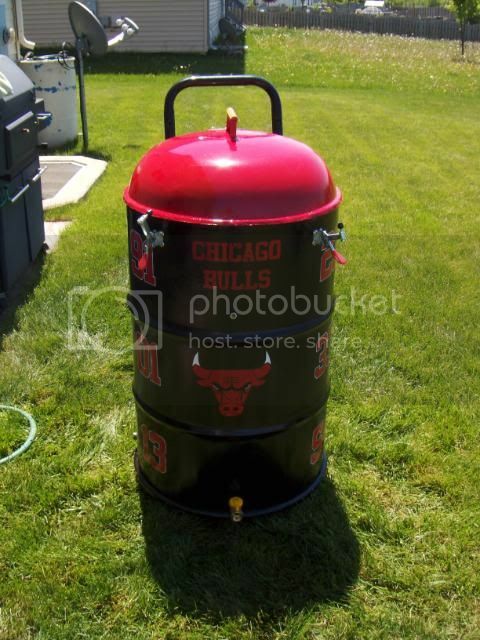 Ugly Drum Smoker - Page 530 - The BBQ BRETHREN FORUMS. So after my first two cooks I was getting a little metal taste. I have an unlined drum and someone suggested to burn it out, just in case. If I do this, how hot/long to burn it? I also got the suggestion of a diffuser/baffle. I have a metal pizza pan that has the holes in it. I'm thinking cover in foil and go with it. Comments? Here are a couple of photos of the lid. I have to confess that I have full access to welders, cnc plasma cutters, a press brake, and a full machine shop. This was my first go. I think in the next few months I will have a bunch of these seeing how I found a barrell source for 16 dollars. We also have a sandblaster so my next barrell will be a lined one that I sandblast myself. I do have some grinding to do on this lid before I can paint it. If you are sure it is unlined i wouldn't worry about burning it out. You could be tasting creosote on your meat. Make sure the smoke coming out is thin and blue before putting your meat on the grill. Also put the pizza pan covered in foil under your meat so the grease doesn't burn in the fire. I personally don't like the smell or taste of burnt grease. I use a terracotta pot base covered in foil under my meats on my drums. Hope this works. Been to the cattle call but figured I'd post a pic of mu UDS built in honor of those boys in red and black(sometimes white too). Going to start a dedicated thread per suggestion where I'll post up some more pics and info. Very cool, love the fire box acess pannel. 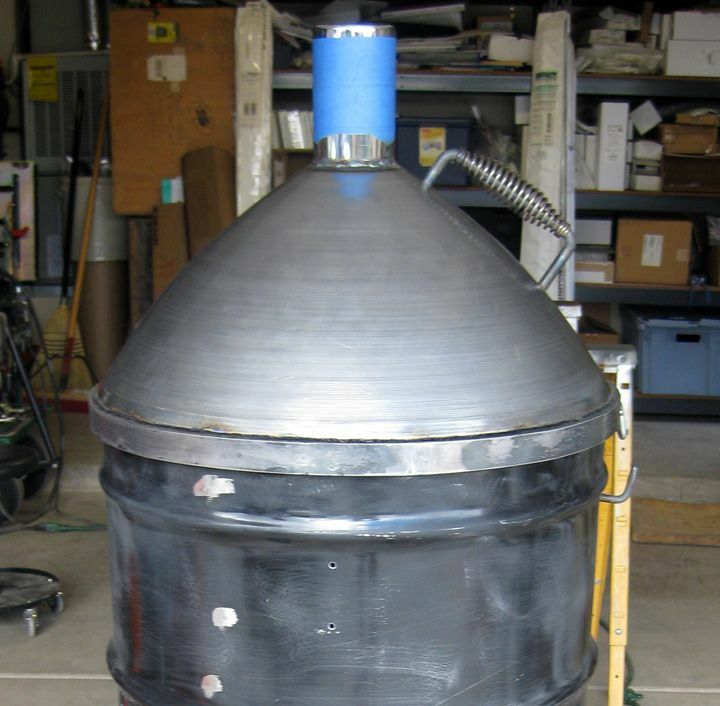 I have a question for a couple of UDs Im building. Sorry if the answer is in here somewhere. Is it better to have the chimney with an adjustable damper? Or is just open and close good enough? Looks like most of them just have an open stack. Open when in use, closed to shut it down. Control the temp with the intakes. Thanks much, Im kinda rusing cuase they are for a user that has to get them going soon for an event. Anybody know a decent budget thermometer? I went to a BBQ store and the cheapest one was like $35. Does home depot have them? Cool thanks, I was gonna head there tonight but never made it. Ill try there tomorrow. Should wrap these up tomorrow, ill post some pics, they are little different with cut off drums as lids. May be a little heavy. So I drilled an extra hole about 7" below the top of my UDS. I wasn't paying attention. The hole diameter is so small. It's about the size of the smallest bit in my drill kit. Should I leave it or drill a little larger and put a screw in it? Have you cooked on it yet? I say leave it alone until you see how it cooks. You can always throw a cheap magnet over it unti it cools down enough to mod. Heck, attach a mini elbowed smoke stack to that hole to trick it out. Might be the next new thing. Let us know what you do, regardless. Hey Crash you might have something there! We always lower the exhaust on an offset to grate level why not on a UDS. But then again it's a whole different design.